I am an independent member of the Zimbabwean society, meaning that I make rational decision and conclusions on political matters. Officially I am trained in the accounting profession henceforth in my submission to the commission I will use my accounting skills to analyse significant events and circumstances that have led us to be where we are as a nation and in particular to what led to the events of the 1st august 2018. In my submission I will be representing ordinary Zimbabweans whose main concerns are not political, who face the difficulties and issues to do with their day to day livelihoods. These concerns are on rising prices of basic commodities due to inflation and their economic wellbeing. I will repeat the contribution question I posed the panel for the Harare town hall hosted by VOA and the media centre, "Are we Zimbabwean citizens, our media, and our political actors being too reliant and obsessed about issues to do with elections? A year before the general elections all issues being discussed and being published by our news outlets are mainly on elections. A year after the election it's all talk about the previous election. Two years down the line issues which would have arisen that can be solved by other means will be said to be solved by the next general election. As a nation we have to find other ways to solve political deadlock matters urgently as these affect the wellbeing of ordinary citizens and in my submission I will try to give concrete recommendations and a road map to end this through dialogue thus being truly honest to one another for progress to be achieved. This submission will be very different to those made by my friends in the political space mainly the lawyers and colleagues in the arts that appeared before the commission in the past months. In accounting in our recommendation formulation process we take into account trends through the interpretation and extrapolation of all the information available from the past and predictable future on a particular matter being considered. Now to the issue of the 1st August killings to which I will submit my arguments, the critical issues are what were the circumstances that led to the post election violence, who were responsible for the killings and what can be done to avert future incidences of such a nature. On answering the question on who were responsible for the killings on that day. The answer is very simple IT IS ALL OF US ZIMBABWEANS; we are all responsible for the deaths of our fellow colleagues. As a nation we all have to come to terms with this truth for us to find ways to heal, reform our laws and thus prevent future incidences of such a nature from happening. Let me now explain to you how we all contributed to the death of our fellow colleagues. In the operation the commander of the defence forces deployed the national army. I will repeat this statement because from today people must start knowing their places in our governance systems. So I will say it again, the commander of the national army deployed the national army against and kidnapping the commander-in-Chief then Robert Mugabe for days until his resignation. In the actual chain of commander this meant that an individual who is number three in command had deployed the national army against number one in the chain. On the 1st of August the same individual repeated deployment but for this incident he was now number two in the chain of command. The vice president who was also the minister of defence then had the backing of a flawed Act, The Public Order and Security Act (POSA) that is not consistent with the constitution of 2013. 1) The opposition MDC Alliance – It is my belief that one of the most crucial roles played by an opposition political party in a democratic country is that of ensuring that constitutionalism and democratic practices are observed and maintained by the ruling party. The MDC Alliance did not act in this way in the wake of Operation Restore Legacy. The political party failed to defend one of most sacrosanct clauses enshrined in the constitution of 2013. The constitution emphasises that the national army can only be deployed by the commander-in-Chief. In the operation the commander-in-chief Mugabe had the national army deployed against him by General Constatino Chiwenga who was 3rd in the chain of command. In Advocate Nelson Chamisa submission to the post election violence commission on the 26th of November 2018, I don't really understand the statement were he said "The MDC's participation for Operation Restore Legacy was about the right to vote." Up to today I don't really understand what he meant by that for a clear constitutional violation happened in plain view of MDC to which now they complain for the events of August 2018. On many occasions the MDC has acted in this way of just going with the wind and being used by Zanu Pf because of its un-strategic and unprincipled tendencies. In their submission to the commission they went on to say "to violate this sacrosanct constitutional provision their leadership had received promises from some Zanu Pf officials the likes of Victor Matemadanda to help vote with them against Mugabe in the planned impeachment vote. In the end the impeachment vote did not materialise as Mugabe resigned leaving Zanu PF with no obligations towards MDC. The party had also been used in the marches to state house in the same operation and in the end the party found itself dumped on the issue of forming a transitional authority as Zanu Pf formed government alone. What was sad was that the party had been used to violate our constitution. 2) The Judiciary – This is the other arm of our governance system that is tasked with the enforcement of our laws through making sound and proper interpretation of the constitution. In a petition brought to the High Court by parliamentarians Joseph Evurath Sibanda and Leonard Chikomba arguing that the military intervention was constitutional Justice Chiweshe made a bizarre judgement that validated this constitutional violation. In the judgment, Justice Chiweshe said that the intervention was necessary to stop the elected first respondent's constitutional function, seeing that his duties were now being influenced by those around him, who were not elected using section 212. The judgment gave the second respondent the right to act in the manner that allowed him to deploy the military without orders from the Commander-in-Chief. This judgment has created an unfavourable trend through this precedent ruling that is also not consistent with the constitution. Dewa Mavhinga the Southern African director in the African division of human rights watch in his submissions to the US senate on foreign affairs on December 13, 2017 says ,"Whatever the merits of the ruling, the judgment could embolden the military to carry further incursions in Zimbabwe's political or electoral affairs in the future." In the submission Mavhinga both warned and prophesied implications created by this judgement that legitimised Operation Restore Legacy back then in late December 2017. It was no surprise that just five days after the incident of the 1st of August the United States senate voted in favour of renewing and updating the ZIDERA sanctions Bill citing inconsistencies and use of prior laws by the Zimbabwean government that are not consistent with the constitution of 2013. 3) The Zanu Pf Party – Zanu Pf for a long time had being entranced in a bitter internal political struggle over leadership positions post the Mugabe era. The party had for a number of years failed to institute a clear succession plan with clear democratic processes to follow for the replacement of their ailing leader. On this same issue the main opposition MDC is equally liable to having vague processes for leadership replacement. All these political organisations need to sit down now, thus agree and formulate clear democratic processes for leadership replacement and contestations for their political parties to survive the next round of changes. We can no longer have the military settling leadership disputes mainly in Zanu Pf. The MDC cannot also any longer have its leaders being installed from the preference of former leaders. The post election violence commission was lucky to be chaired by former South African president Kgalema Moltanthe who once stood for elections to be president of the ANC in the past. This is what it means to have clear procedures for contestation within political party. Although Moltanthe lost the party leadership position the ANC remained united. We can also draw reference to the just ended contest between the current South African president Cyril Ramaphosa and Nkosazana Dlamini-Zuma. A hard-fought internal battle on policy and leadership within the party was conducted that was free and fair on all candidates. In the end of all this ANC remained united with the rivals now reconciled thus working together in the new South African administration. The other factor hindering democratic conduct in political institutions are vague and undemocratic constitutional provisions like the sections 129 (K) recall provisions and the provision that says the vice presidents serve at the pleasure of the president. These constitutional provisions have been used to silence and suppress challengers to policy within the political party and eliminate contenders to top leadership posts by incumbent leaders. These clauses have thereby concentrated to much political power towards one individual in the party that is the president of the party. 4) The ordinary Zimbabweans – As ordinary individuals we are also involved in creating this situation for we marched and praised an unlawful act henceforth implicated in the violation of our constitution that led us to the events of the 1st of August killings. As I will explain other events like the Gukurahundi event later on you will see the dangers of having these multiple deployment point in our constitutional order. To conclude on the issue of Operation Restore Legacy, now that we know that we all acted irrationally and emotionally thus sow the seeds that produced these inconsistencies to the deployment of our national army. We now have to find ways to forgive each other as a nation, reform the laws to remove these inconsistencies, console the bereaved families and find ways to heal the nation thus continue ahead as a united front. Although we all committed this flawed act (Operation Restore) we achieved the end to the Mugabe era, bringing about an opportunity for a new favourable culture centred on openness within the democratic space that has now been widened for the first time in years. Our nation has traditional not been run as a true democratic, equal and just society for a long time. We can trace these oppressive tendencies to the colonial days especially on how the nation was run during the administration of Ian Smith before the attainment of independence. The same state apparatus setup that was used to control the majority black population by the white settlers was the one inherited by the administration of the then prime minister R G Mugabe who became president later on. As I've always said in my previous writings that everything happens for a reason, thus the apparatus inherited by Mugabe was crucial on how this country has maintained its territorial integrity to this day. Let me now comment on issues that happened long before I was born purely from a historical perspective this is the Gukurahundi issue. As a nation we have abstained from this crucial issue were we have just assigned sole blame to the former president. In my submission I will highlight some of the factors that Mugabe had to conceder in the formulation of his decisions on the dissidents issue in Matabeleland and the ethnic rivalry created. During the liberation struggle the fighting forces Zipra and Zanla with their political organisation ZAPU and ZANU respectively had their membership mainly based on ethnic groupings which are the Ndebele and Shona tribes respectively. The union between the Zipra and Zanla commanders from the onset was shaky when they operated from a single base in Zambia. This situation led the Zanla fighting force to relocate to Mozambique to reduce tensions. Towards the end of the liberation struggle the Zanla and Zipra forces again united under a single command fighting force the Patriotic Front. Their respective political organisations ZAPU and ZANU also merged to participate in the Lancaster house conference as a united front. When the Lancaster house agreement was secured and election dates set, issues to do with leadership positions came to play. Does the Patriotic Front present one candidate to represent them in the independence elections and who between Nkomo and Mugabe was to be that candidate? Due to these issues and ethnic divide the Patriotic Front had to demerge and thus contested in the independence election as individual parties. This slit gave the shona supported ZANU party election victory as the Zimbabwean population was dominated by the shona tribe since the Ndebele tribe constituted around 17% of the population of the country back then. In the infant stage of the administration of Zimbabwe Mugabe had to deal with the serious issue to do with the integration of the nation army. This new army was to be constituted by ex guerrilla forces from these black political organisations and the convectional Rhodesian army. 1) Create one national army that he had full command as commander-in-chief by deliberately removing ethnic lines through assigning command duties to his own ex Zanla commanders over the entire national army. 2) Agree in principal that the national army is one but maintain ethnic lines whilst assigning these elements to be in charge of the defence of certain sectors based on ethnic boundary lines within the country. These two major options had their own advantages and drawbacks considering the infancy of the nation and how armed all these elements were in the early years of independence. The first option which Mugabe took meant that he was now truly the commander-in-Chief of the whole national army but risked a backlash from ex- Zipra elements for he had to assign ex-Zanla commanders on military battalions that were mainly ex Zipra. In this option he risked having ex Zipra loyal elements being turned into dissidents and surely this happened with time. The second option was aimed at maintaining peace between the various elements within the national army. The major risk for Mugabe that I liken to the current situation we are having as a nation from the November coup and 1st of August killings is that of having multiple deployment command centres within one national army especially back then when we were still an infant state. It is important to note that following the independence election Mugabe had attempted to accommodate ZAPU leaders in his government even when he was not obliged to do so. He had appointed Nkomo to the home affairs ministry and other ZAPU leaders the likes George Silundika, Joseph Msika and others despite his mandate to form government as ZANU alone. On the integration issue by choosing the first option Mugabe obviously created tensions in the new national army thus the dissident problem worsened in the Matabeleland regions. Mugabe was forced to act to solve these issues harshly by expelling some ZAPU leaders from government and instituting the Gukurahundi events in that region. These events were quite unfortunate to say the least as they led to carnage and what many termed the suppression of the Ndebele ethnic group. Reflecting on other countries that fought liberation struggles for example The United States of America. America won its independence from British rule declaring independence from it on the 4th of July 1776 thereby creating a union of states bound by the first constitution in the world. After years of unity tensions within the American union emerged whereby some southern states had to secede from the union on a matter of principal rather than ethnicity. The north and south were at war because of the issue of slavery, with the south wanting to maintain slavery whilst the northern states being opposed to the practise. Brothers from the Southern states and the Northern states had to kill each other on matters to do with principal. I will quote the then American president Abraham Lincoln who says "A house divide against itself cannot stand." He continued: "I believe this government cannot endure permanently half slave and half free. I do not expect the Union to be dissolved – I do not expect the house to fall – but I do expect it will cease to be divided. It will become all one thing, or all the other." Now I will point out a union that failed to maintain its territorial integrity that is found in the Korean peninsula. South and North Korea are two brother states that have failed to unite up to now. After world war one in 1945 the Northern peninsula went under communist rule from the Russians with the Southern peninsula being a democratic state under American rule. When the colonising powers Russia and America left the peninsula in 1948 they failed to unite these two states because of their different governance systems. Two years later in 1950 Kim II-Sung tired to unite these two opposing nations into one system by invading the South but he failed leading to the stalemate currently in the peninsula as these different systems in capitalism and communism have caused permeate divisions between the two brother States. These were the same set of circumstances present for our former commander-in-chief Robert Mugabe when reviewing decisions regarding dissidents and events in Matabeleland. He chose to act to keep a greater rift from emerging for our union to remain intact. To some extent these actions have managed to unite and keep the peace in our union to now. They are surely many counter arguments presented on other factors leading to the Gukurahundi events highlighted in the documentary 'Gukurahundi Genocide 38 years later'. Narratives saying that the arms caches were stage managed by Mugabe and his intelligence to alginate ZAPU as a political party and thus help him establish a one party state that he so admired. In the same documentary interesting admissions from Misheck Velaphi a Zipra administrator are captured were he confessed that surely Zipra had arms caches in the region but these were kept for the South African ANC for their struggle against apartheid rule in their country. Other narrative place the idea that these events started because the ZANU government had intelligence that ZAPU had plans to partition the country according to these tribal divisional lines. In a Gukurahundi interview shoot by Zenzele Ndebele interviewing Dumiso Dabengwa the former Zipra commander spoke on the integration process of the national army and how he felt to have ex Zanla commanders placed in charge of ex Zipra dominated battalions. He explained that the ex Zipra commanders were more trained than their junior ex Zanla counterparts who were now their seniors. Mugabe and Nkomo in 1987 finally decided to bury their hatchets after discussions thereby signing the unit accord on 22 December uniting their ZANU and ZAPU parties into one ZANU PF. I hope by opening up this taboo issue a border engagement processes leading to recognition of these unfortunate events by senior government officials, compensation of victims and healing processes can be instituted for the nation to find closure on this contagious issue. If the Gukurahundi issue is not opened up for debate for healing purposes, misguided elements in our political space will continue to use the issue for political gain rather than for national healing purposes thus threaten the union and our territorial integrity as a nation. After this unity accord the country had to move on and move on it did but with high levels of suspicion and a growing unfavourable culture of having government centralise resources and decision making at the capital Harare. Although this centralisation trend worked in favour of the then president Mugabe on his quest to consolidate power and authority, this led to communities that had in the past been directly involved in decision making through devolved urban councils to lose a say in the running of their affairs. The Urban Councils Acts of 1995 was characterised and built upon the concept of upwards accountability rather than the devolved culture present since independence. The then central government led by Mugabe for reasons of maintaining territorial integrity and risks explained above started to control each and every lever of power in the country using the state apparatus I alluded to at the beginning. In every strategic option chosen they will be positives and drawback especially in the case of the Mugabe era which stretched for a long period. The major drawback to Mugabe amassing this level of power was the death to the culture of openness in both body politics and our communities that now lived under these breakaway fears and centralised system of governance. The more centralised the government became the more power Mugabe had control over government itself and his party ZANU PF. This situation led to a culture of non contestaion on government and party policies. No person could challenge whatever the then president said. This culture also cascaded down to all levels of authority as government officials assessed great power for themselves at the expense of the communities. This situation worsened when the opposition the MDC emerged in 1999 to now to which this culture of suppressing those of a different view point has grown. Now that the Mugabe era ended a new culture of openness is being propagated where views are now being expressed in every sphere of our political environment. Never in the time I have lived in Zimbabwe did I see a commission of inquiry being televised to the nation like the just ended 1st of August shooting commission. As a nation we have to be aware that all our problems won't be solved overnight but the Mnangagwa era although it has its early faults carries a sincere and genuine commitment on dealing with the dark old issues of intolerance, suppression of freedoms of ethnic groups and political parties. Its quit unfortunate that with all the sincerity the current president and some senior members of his cabinet are haunted by the past on issues to do with suppression of freedoms, intolerance and even the Gukurahundi massacres. As they always say no person can change his or her past but rather one is encouraged to view the past with the intention of addressing to aid future events. President Mnangagwa terms himself to be a servant leader and for me a servant does not request or demand to be respected like the scenes witnessed in our parliament in recent months. A servant leader is different from a king like leader we used to have leading us who did not tolerate challengers or questions on his personal incomes and authority. Many questions we posed to Mugabe about separation of government and personal resources went unanswered. Questions on sources of incomes used in the construction of his famous Blue roof house located in Borrowdale Brooke. The same questions are now being posed to the servant leader and these and many other questions cannot go unanswered in the Mnangagwa era. The greatest cultural challenge we are currently having in the country is that of having a heated unending political climate characterised by one trying to climb with the other pulling down at every turn of our political engagements. It is my wish that these major political parties unite to achieve a honest, open and just culture aimed at speeding our nation building process. I had previously said that we talk about elections so much but I will dive into the subject explaining complexities and opportunities highlighted by the 30th of July 2018 election results. To put out my opinions and recommendations clearly, let me first summarise the official and contested Chamisa results. Before analysing these results, let me point out that on the 31st of July 2018 the Newsday published an article I wrote which I titled "The Zimbabwean Dream." In the article I analysed three election manifesto campaigns that is the Nkosana Moyo APA, Nelson Chamisa (MDC A) and Emmerson Mnangagwa (ZANU PF). I continued by saying that all these campaigns are all in union vital to the development of a prosperous nation as the first represents the present with it what should be done now, the next representing the future with it what can be achieved and the last representing the past with it lessons of worth as we progress. From the analysis of the political terrain it was my understanding that this election was going to be a heavily contested race. Though writing I had tried to reduce tensions between these major political parties by trying to bring out a centre point aiming to unify them towards a united and prosperous nation where all contribute. The August events weighed so heavily on me as they transpired a day after this publication. That meant I had failed on the objective of unifying this massively divided nation. 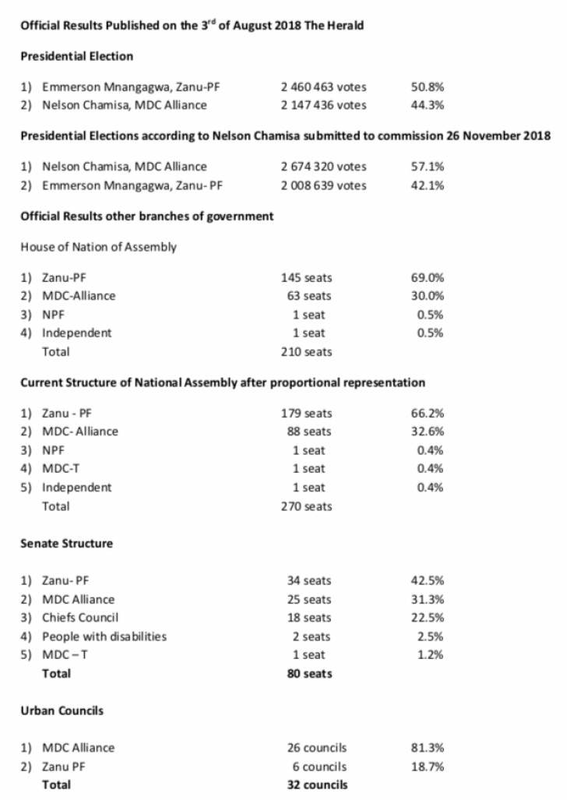 The first complexity comes with all presidential results tallies the official and the MDC Alliance tally. The honest conclusion even if we add up and divide these result tallies we see that truly as predicted the population of Zimbabwe is massively divided. The second issue is when we take the MDC Alliance result tallies as being credible and we say Chamisa is president they will be massive hindrances for him forming a functional administration. This is so for the MDC A accepted the parliamentary result for which ZANU PF attained a two-thirds majority needed for effective governance. This means that if Chamisa wants to change policy or laws on submission to the parliament these changes will be immediately shoot down by the ZANU majority. A Chamisa administration will also be prone to many impeachment attempts which will thereby reduce his effectiveness. Another complex interpretation of all the results tallies is how these votes were divided on a community level. Analysing the parliamentary and urban council results you can clearly see the electoral bases of the two parties ZANU PF and MDC A. The ruling party's strength is in the rural areas with the MDC A controlling 81% of the urban councils. It is also very difficult for the current ZANU PF government to effectively govern without the support of the urban population for most policy changes are meant for the urban population. The divide of the overall and geographical vote highlighted above with a culture of decentralising decision making by devolving government through the creation of provincial councils. These two political parties need to dialogue for the creation of devolution laws that are favourable for all. These devolution laws are also vital for the promotion of an open society which does not suppress ethnic groups on decision to do with the running of their affairs as communities. In a recent town hall meeting in Bulawayo also hosted by the VOA and Media centre on evaluating the first 100 days of Emmerson Mnangagwa the biggest issue arising from the Matabeleland region are rights to their own resources by wanting these devolution laws to be enacted immediately. When explaining about Gukurahundi I also touched on how and why devolution had been successfully for the country since the attainment of independence and how devolution ended in favour for a central government under the Mugabe administration desire to centralise decisions. It is important to note the functions and powers that previous urban council possessed before these actions which included the generation and distribution of electricity, water treatment and distribution to households, housing, road maintenance and construction works, sewage relief and many other functions which we then centralised as per Mugabe orders. The changing and updating of the urban council acts created centralised institutions like ZESA, ZINWA, and later on when the main opposition the MDC emerged others like ZINARA and posts like Ministers of State were established in cabinet all in an attempt for ZANU PF to maintain power in Urban councils that the party had not being elected. Now that I have highlighted some of the provisions and functions to be included in the new Provincial councils Act for effective and efficient governance councillors must also be required to posses certain levels of academic and post academic qualifications. In a study by Wellington Jonga on 'Local government system in Zimbabwe and associated challenges', he points out that one of the major issues hindering the effectiveness of urban councils are that of having councillors voted into councils that don't posses any academic or post academic qualification now directing council activities and employees that might be more educated thereby creating tensions. In conclusions the critical issue to be addressed by the commission is that of having multiple deployment point to our national army. I could have listed all the recommendations but rather maintained them in the text for they have more weight in the context they were made.